"I decided I don't want to buy these," I said to my favorite Target Cashier, the elderly woman who shares the latest celebrity gossip, as I handed her the $7.99 earrings. 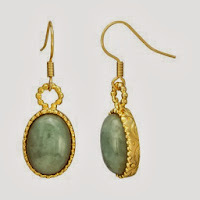 "Let's have a look," she replied, and after giving the faux-jade studs a good, long stare, she said, "Yeah. They're ugly. I wouldn't wear them." It should be mentioned that at the time I was sporting camo pants, red patent-leather sneakers and the frumpiest sweater in my extensive frumpy sweater collection. So it's no surprise Dolores (not her actual name) thought my taste questionable and decided a second opinion was necessary. "Then again, I'm an old lady," she added. "When I was younger and had to dress up everyday, I wore colorful jewelry all the time." The door to her personal history now cracked just the tiniest bit, I felt like she would have been willing to swing it wide open if only I had asked, "What did you used to do?" or, "What job required you to dress up everyday?". And I wanted to inquire. But once at the airport I asked an older TSA employee how he liked his job, and he lowered his eyes, shook his head and said "Stay in school." Since then I've avoided asking near strangers about their career history/satisfaction. Instead I just make imaginative, idealistic assumptions. Like, maybe Dolores had a brush with stardom. Perhaps she was a backup singer for a suave, sultry-eyed crooner? Played a minor role in a major box-office hit? Danced at Radio City Music Hall? Or she could have been a bigwig, of some massive corporation. A well-dressed, colorful jewelry wearing CEO. Whatever the case, I'm glad Dolores decided to leave her former career and get a job at a small town Target because I'm really terrible at accessorizing and it's nice to know someone is there and willing to help.